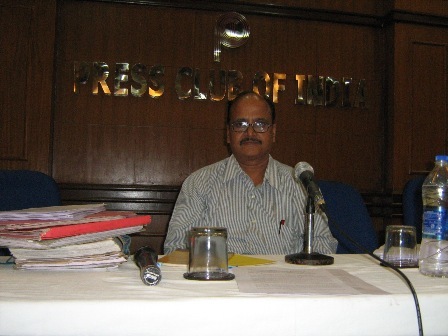 A Press Meet was arranged at the Press Club of India, New Delhi, to highlight how the Supreme Court failed to safeguard consumer interests in our landmark case, involving under-weighment of LPG refills by M/s IOC. Crores of consumers across the country were deceived for decades and provided under-weighed LPG refills worth, even by conservative estimates, over Rs. 65,000 crores. Consumer Protection Act provides for a penalty of a minimum of 5% of this value. For reasons, which the Court alone is privy to, they skirted the issues involved and passed an order on our Appeal, pretending as though they had not understood the "GROUNDS" of our Appeal. Knowingly or unknowingly, the bench had squandered an opportunity to strengthen the consumer justice system and to penalise the Unfair Trade Practice, in a way signalling that such things do not matter in this country. Though, it should make the blood boil over such irrelevant judgments and injustice to a hapless consumer organisation which steadfastly pursued the matter for nearly 13 years, some remedy can be expected only when we continue to highlight such high-handed behaviour of the highest judiciary of this country. Do we really need laws in this country? If the Acts passed by the parliament are not to be the mandate within which the judiciary is to deliver its judgments, then what is the relevance of such laws? Supreme Court’s judgment in Civil Appeal No. 10126 of 2010, Consumer Protection Council, Rourkela vs. Indian Oil corporation Ltd. and Ors., raises these fundamental questions. The referred case involves under-weighment of LPG refills (cooking gas). Consumer Protection Council, Rourkela accidentally stumbled upon this fact, through random sample surveys conducted in July 2000. Indian Oil Corporation (IOC) as well as the Ministry of Consumer Affairs, Government of India, including the Director (Legal Metrology) were informed and requested to act. On account of this, IOC offered to conduct a joint survey. Since the outcome was worse than even our own independent findings, they excused themselves mid-way through the survey and did not even sign the papers. The Company was not willing to accept the fault nor was willing to discuss about a solution. Hence, a case was filed in July 2001, before the National Consumer Disputes Redressal Commission (NCDRC), as the loss inflicted on the consumers by IOC was estimated to be Rs. 750 crores per year. While the case was being heard by the NCDRC, the Consumer Protection Act was amended from 15th March 2003. Several important provisions which were relevant to this case, especially for awarding punitive damages, payment of penalty when the defective good or deficient service affects large number of consumers, providing adequate cost to the litigant, etc. were introduced and the Council in January 2004, itself sought the invocation of those provisions in this case. The NCDRC, based on the findings of the Professors of IIT, Kharagpur, and the Committee set up by the Ministry of Consumer Affairs, Government of India, concluded in October 2005 that in the then prevailing LPG bottling system, consumers could get less than the stipulated weight of 14.2 kg and hence as an interim measure directed IOC to adopt pre-delivery weight checking of the LPG refill at the consumer’s premises and also to publicise through advertisements as was being done, in a prominent manner, by Hindustan Petroleum Corporation. IOC did not comply with the 2005 directives and NCDRC took on record such behaviour, in 2006 as well as in 2007, at the instance of the Complainant Council. But the final order of the NCDRC passed in July 2007 glossed over all that and also the prayers of the Council for making the awards as per the amended Act. Hence, the Council appealed to the Supreme Court in 2010 against the final order of the NCDRC made in July 2007, after a delay of 1,071 days. The case was heard by Justice G.S.Singhvi and Justice S.J.Mukhopadhaya. While the Supreme Court condoned the delay of 1,071 days, obviously because of the review proceedings in the NCDRC contributing to the delay, failed to address the issues raised in the appeal, which were hitherto not addressed by the NCDRC. The judgment of the Supreme Court said that the appeal was ‘infructuous’ as both the government and IOC had complied with the order of the NCDRC. How the Judges came to this grossly wrong conclusion about the subject of the appeal is indeed appalling, as even an unqualified lawyer would not have difficulty in understanding the grounds of appeal. The basic question as to why a delay of 1071 days was condoned will obviously demonstrate the glaring error in the judgment. The huge delay was condoned because the Council had sought review of the order of the National Commission for the apparent errors, including but not limited to non-invoking the provision of Sec. 14(1)(hb), etc. of the Consumer Protection Act after having concluded that a large number of consumers were affected by the under-weighed refills delivered by IOC. But the judgment after having observed that the appeal is against the order of the National Commission, has failed to discuss the order in any manner. Instead, the impugned judgment discusses the compliance part of the government and the oil marketing companies, which was not the reason for which the appeal was preferred. Incidentally, on 16.10.2012, when the instant appeal was being heard, finding that the bench was missing the real issues and was concentrating elsewhere relating to pre-delivery checking, filling of equal weighted refill cylinders, methodology to know the content of the cylinder by pressure gauge, printing of right type of Receipts by the dealers and so on, the undersigned intervened to say that the appeal was mainly relating to non-invoking of certain important provisions of the Consumer Protection Act, namely, Sec. 14(1)(d), 14(1)(hb) and 14(1)(i) and the National Commission had already taken care of the under-weighing problem by ordering for automation of the LPG bottling plants. Hon’ble Justice G.S.Singhvi specifically assured that all these will be discussed in the final order. When an individual is dissatisfied with the order of the National Commission, he appeals to the Supreme Court, under Section 23 of the Consumer Protection Act. The Supreme Court has to conclude only whether the NCDRC order is maintainable or not, based on the facts placed before it. No appeal can become ‘infructuous’ unless it is filed under Section 27A, where the implementation part is involved. The Supreme Court also dismissed the review sought by the Council. If the judiciary has to fail the consumers, where will he go? The apex court was probably finding the issues raised were too big and the issues relating to “punitive damages” had to be addressed for the first time, under Consumer Protection Act and that too against a state undertaking. A cumulative value of Rs 65,000 crore of short-weighed cooking gas refills had been sold by IOC till 2005, the time when an interim order was passed, warranting it to pay at least Rs 3,250 crore to the Consumer Welfare Fund, as per the provisions of the Consumer Protection Act. Seldom a voluntary consumer organisation could take up such a major issue, prove it technically correct and provide tangible relief to crores of unsuspecting housewives across the country. Of the 184 bottling plants, of the three oil marketing companies (IOC, BPCL and HPCL), 180 have been automated and the balance will be done within this financial year. The government (P&NG ministry) was supposed to have spent around Rs 300 crore for this modernisation. Unfortunately, the apex court of the country does not provide relief as mandated by the law, to the consumer organization and the consumers, who relentlessly pursued the matter for over 12 years. So, a Fortune 500 Company after deceiving the consumers for several decades and having successfully adopted an Unfair Trade Practice, supplying Rs 65,000 crore worth of short-weighed cooking gas refills to the unsuspecting housewives, has walked scot-free. Thanks to the ineffective apex court, the consumers and the consumer organisation, which took up the issue, have been left high and dry. A sad truth that emerges is that even the highest Court of the country does not deliver justice; laws do not serve the purpose for which they are made, whimsical decisions of the judiciary remain unquestioned and the people of this great nation will stand to suffer for more time to come. This not so heart warming conclusion is derived as even the preceding CJI was informed about this gross injustice done to the consumer movement, in some detail in Feb. 13 itself, after the Appeal for Review was also turned down.